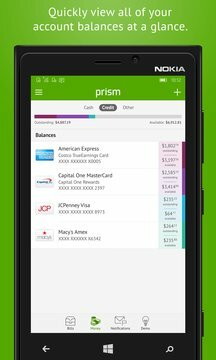 Prism is the best way to check all your balances, track your paydays, and pay all of your bills, anytime, anywhere! Best of all: it's completely free! 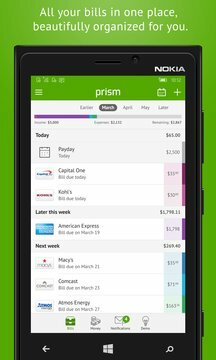 Prism is the ultimate financial planning app that will replace all your other banking apps—it’ll help improve your credit score and get you out of debt! It's easy to get started! Simply add your billers and your bank, and enter your login details. We'll present you with the balances in your accounts, as well as all of your bills and recent payments--and you'll be able to quickly see what's due. When you're ready, pay your bills in seconds! Don’t forget to add your payday in the app to manage your money too! • Prism is 100% free. There are no monthly charges or hidden fees. • See when your upcoming bills are due and how much you owe. • Pay your bills anytime, anywhere, directly from within the app. • Check your account balances to make sure you have enough cash. • Be instantly notified as new bills arrive or if anything is amiss. • Get reminder notifications when your bills are due. Never get a late fee again! • Pay with maximum flexibility: use your credit card, debit card or bank account. • Message our friendly support team with any questions or feedback. • Your information is safe and secure with us, protected with bank-level encryption. Prism is 100% dedicated to your customer experience. We don’t have any sneaky fees for payment; if any payment method requires fees, we’ll show you up front, before payment. You always have 10 minutes to cancel any payment, and most bills are credited same-day. You can message our support and rest assured that Ryan will personally get back to you quickly and help resolve your problem. Check out all our 5 star reviews! Prism supports thousands of banks including JPMorgan Chase, Bank of America, Citigroup, Wells Fargo, Bancorp, Capital One, Mellon, HSBC, PNC, TD Bank, SunTrust, Fifth Third, Santander Bank, U.S. Bank. We also support most credit unions, including USAA, Navy Federal Credit Union, State Employees Credit Union, Pentagon Credit Union, Boeing Employees Credit Union, America First Credit Union, Suncoast Credit Union, Alliant Credit Union, Schools First Credit Union, Digital Credit Union, Golden1 Credit Union, and many others. You can see your credit card balances and pay your bill for most credit cards, including: AMEX (American Express) Credit Cards, Discover Credit Cards, Bank of America Credit Cards, Capital One Credit Cards, Citibank Credit Cards, Credit One Credit Cards, Macy’s Credit Cards, Target REDcard, Barclaycard, JCPenney Credit Card, Victoria’s Secret Angel Card, Kohl’s Credit Card, GE Capital Credit Cards, Best Buy Credit Cards, Amazon.com Cards, Home Depot Credit Cards, Lowe’s Credit Cards, Sears Credit Cards, and hundreds more. Even better, we support all of your billers. The most popular include: AT&T, Verizon Wireless, Sprint, Comcast, T-Mobile, Orchard Bank, DirecTV, Netflix, Time Warner, GEICO, DISH, PayPal, Bill Me Later, Sallie Mae Student Loans, State Farm, Travelers, Progressive, Cox Communications, Charter Communications, Ally Auto, Allstate, Travelers, National Grid, and thousands more, including many utility, mortgage, rent, and loan providers. If you’re looking for a Mint or Manilla replacement, look no further! If you're looking for Mobilligy, Mobiligy, Mobilogy, Mobillogy, Prisim, or Prizm, you're in the right place!